Welcome to Central Tool Co. Inc.
Central Tool Co. Inc. is family owned and operated business located Northeast of Indianapolis. We have over 10,000 square feet of manufacturing space. 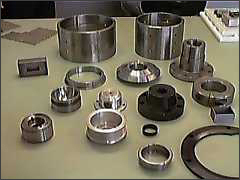 We specialize in Fabrication, CNC Milling,CNC Turning, CNC Drilling and conventional Milling, Turning, Drilling and Welding. With over 50 years of quality service, Central Tool Co., Inc. takes pride in working with their customers, and guarantee their work on time. Our flexibility allows us to accomplish jobs quickly and efficiently. We have done a variety of jobs for different industries. From automotive, farm machinery, seat belts and lawn finish equipment. To animation supplies, race car, military contracts. We even helped try to break a roller blade speed record. Customer satisfaction is what we do best! ©2005 Central Tool Co. Inc. All Rights Reserved.